Adventurer Alex Staniforth with Glen Nevis Youth Hostel Manager, Caroline Knox after the official opening ceremony. 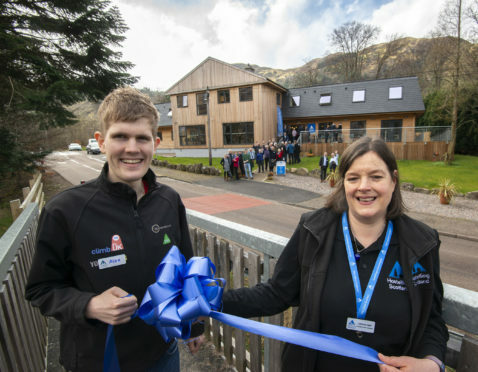 Hostelling Scotland’s Glen Nevis Youth Hostel was officially opened yesterday by record-breaking adventurer Alex Staniforth. The youth hostel, which sits at the foot of the UK’s highest mountain in Fort William, reopened following an extensive eight-month redevelopment project. The makeover saw the building stripped back to its bare shell, completely transforming it into an exciting contemporary living space with private en-suite rooms and shared accommodation. Adventurer and mental health advocate Mr Staniford is no stranger to adversity, having attempted two climbs up Mount Everest, as well as surviving an earthquake which trapped him in the mountains of Nepal for two days. The 23-year-old, who climbed Ben Nevis in 2010 for the first time, told the P&J: “I think, as a young person myself, that youth hostelling makes the outdoors and adventures accessible to most people. “What the outdoors and hostelling does for our mental health is incredible. Some young people spend so much time on computers or gaming or on social media that they can become quite disconnected from the world. Going hostelling changes all of that. “With hosteling people get out and become more resilient. “I know, from my own experience, that when I started getting out and about all over the country nine years ago that my life changed for the better. Glen Nevis Youth Hostel’s £2.1m renovation, completed in the summer, project follows recent development projects at Aberdeen, Loch Ossian, Achmelvich Beach, Oban and Lochranza Youth Hostel on the Isle of Arran. Sabine MacKenzie, operations director for Hostelling Scotland, added: “The building was 80 years old when we decided to take a strategic look at what we wanted to do with it. “We always knew it was a good hostel, but we knew that it had to be upgraded to meet the needs of the modern visitor. “Since we began in 1931 we have welcomed 35 million people to our hostels, last year alone 400,000 people used out properties.